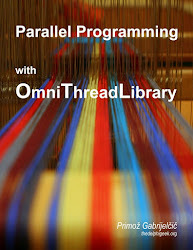 Chapter five of my book Parallel Programming with OmniThreadLibrary is now completed. New version of the book has already been published and all buyers have been notified by the email. Wiki will be updated soon. Please remember – the best way to support the OmniThreadLibrary project is to buy the book! The next chapter on the list is Introduction to OmniThreadLibrary which won the public poll by a very small margin (34 votes against the 31 votes for the Synchronisation chapter).